I binge-watched the first season of Downton Abbey after coming down with a horrible cold/flu. I’d heard about it ad nauseum, and finally succumbed while feeling a bit nauseated myself. I got hooked, and then avidly watched the next couple of seasons until I grew weary of the problems of the English upper class. This year, well, here I am. Dan is gone, and why not sit on the couch for an hour and escape to the manor?–or whatever a grand house like that is called. Now, Edith and me, we’re like this. Edith got pregnant after her first (so it seems) tryst with Michael. The same thing happened to me. She had to keep her pregnancy secret and went away with just her aunt as her confidant. (Somehow Granny finds out, but I missed that part.) In my case, only my parents and boyfriend knew. My siblings were in the dark just like Edith’s. Shame and ruination figured mightily in English society in 1924 as it did in my small Catholic town in Iowa in1970. Edith manages to keep her secret, as did I, and returns home with her reputation in tact. Life goes on. But the sadness overtakes everything. Edith can see her little girl, while my son was adopted in a closed-records adoption. 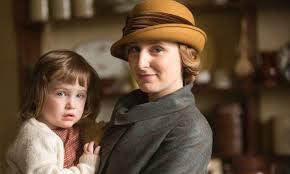 I’m pretty sure that if some relative had been brought in on the secret and claimed him as their own, I would have done what Edith did in the last episode. I don’t really care about Mary and her exploits. She seems to get away with everything. I don’t care about Cora and her pouty Robert. Rose can have her Russians. Cousin Violet can marry whoever she likes, and Granny can form a menage å trois with the prince and his wife (if she’s found,) just give me Edith and Marigold. Show me how they manage. How Edith makes it work. How she loves her little girl and keeps her as her own. This entry was posted in Uncategorized and tagged Dwonton Abbey, Edith and Marigold, secret pregnancy, shame on February 10, 2015 by declemen.